?Medal of Honor? 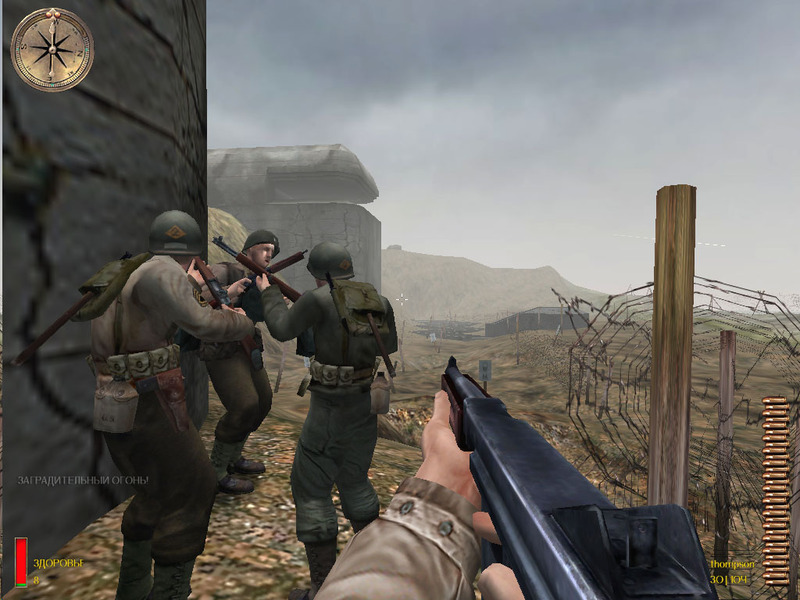 is a WWII first person combat shooter. The game provides a good amount of action in a beautifully rendered environment. The music gives you the feeling of triumph during victory and mystery during stealth. The enemy AI offers a good challenge and provides some great action. Even so, MoH:AA suffers at times of being too linear and overly scripted. But do its strengths outweigh the weaknesses? You bet. You play as Lt. Mike Powell, part of a special American OSS (Office of Strategic Services) team, sent to fight the Germans in various parts of Europe and North Africa. Your typical missions will have you retrieving a secret weapon or document, destroying key German weapons, and getting directly into the action. You will feel a part of the battle, and a part of the team. One of the really nice things about Medal of Honor is the gameplay dynamics change throughout the course of the game. In some missions, it?s just you against the enemy. In others, you work co-operatively with friendly AI. There are several small missions requiring you to sneak around with your sniper rifle. You will even get to control a tank in some of the missions. These different aspects help to keep the game flow from feeling all the same. The co-operative missions are especially fun. You have a team you will want to protect. And in return, they will help protect you, will help spot the enemy, and help to make you feel a part of a team. It?s no longer just you against the enemy. You have a team now. They talk to you. They work with you. You want to help keep them alive. As they suffer damage, they will even begin to limp. If I were to point out one thing, I would have to say the game is extremely immersive. You feel like you are in the battle. You feel like you are there. From the weapon sounds, to the maps and architecture, to the grenade smoke. About the only thing missing is the smell of battle?and the blood. Yep! There is NO blood in the game, but that does not detract from the sensation of what it must have been like to be in battle. One of the highlights of the game is the invasion on Normandy (Omaha Beach). There is a nice cutscene of you and the other ships moving towards the coast and eventually stepping out into the water. At this point, there is the constant rattling of gunfire. Explosions going off left and right. People screaming and giving directions. It?s pure chaos. The only thing on your mind is survival. It?s an extremely tough part of the game, but the feeling of victory when you finish is well worth it. The one problem with the game is its highly scripted nature. If you die, you know exactly where the enemy will be the next time you replay. After one time I died, I just stood and waited for a particular enemy to walk by. He didn?t show up, so I moved forward and once I passed a certain point, he suddenly appeared. On the other hand, the sniping levels can have some very difficult parts and knowing where the enemy is hiding can come in very handy. The graphics in the game are very well done. Often, I would just stare at the trees waving and the building architecture. There are environmental graphics for both rain and snow. There are day and night scenarios. Plus, the level of graphics CAN affect your gameplay. If you have smoke turned on, it makes it difficult to see after a grenade explodes. There is a nice, thick puff of gray smoke, making it difficult to spot your enemy. The two things sort of lacking are some better lighting effects and better looking humans. Each map is truly unique and different from the others. You will get to run through a Moroccan town, sneak into a German submarine dock, land on Normandy beach, pass through bombed out towns?there are plenty of different locales and they look beautiful. With each location being so different, you won?t be looking back and thinking, ?This is just like the last mission.? Instead, I was amazed at how many unique things the developer?s can throw at you. The sound in the game is excellent. The weapon sounds are clean and precise. One of my favorites is the Garand M1. The M1 has a distinct ?ching? sound as it automatically flings its clip when depleted. The music is heroic, triumphant, and cinematic. Very well done and fits perfectly with the epic feeling of the game. This game proves you can have a fun game without the blood and swearing. The only time I found swearing was during the raid on Normandy. They used the ?D? word a few times. And it?s true?there is no blood in the game. But when shooting the enemy, they will grunt/groan, they will stumble and falter, and I?ll admit, for a split second, I feel sorry for them. There is a sort of realism to it. There are many parts of the game requiring the use of a sniper rifle. There are several types of machine guns, grenades, tanks, and a rocket launcher. In one sense, the game has an educational quality as well. I understand a bit more about the raid on France. I see a little bit of what war must have been like in WWII. The game portrays God neither negatively nor positively. But I have to mention this. In the mission briefing for Omaha Beach, your superior officer does call for the ?blessing of Almighty God.? I thought that was a nice touch. The action, the stealth, the music, the feeling of ?being there? ?it all adds up to an extremely well done and exciting game. The game does include multiplayer capability and there are several maps and mods available. This game has easily made it into ?SSquared?s Favorite List?.